With the midterm elections well underway, the signs of record-breaking voter turnout are strong nationwide. 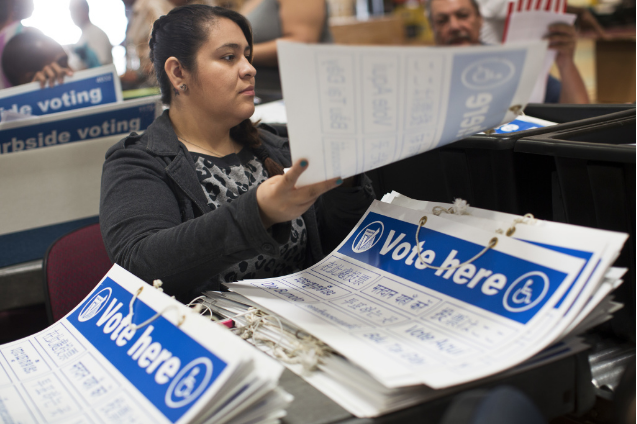 In California, where I live, as of late October, a record 19.6 million Californians were registered to vote, up nearly 1.9 million voters since the 2014 general election. Of all eligible Californians, 78 percent are registered, the highest percentage since 1950, according to the secretary of state. News outlets are relishing the surge in numerous ways, publishing the requisite endorsements, but also extensive voter guides and interactive maps. Even in the midst of this civic engagement surge, some regions are — relatively speaking — underperformers. Los Angeles, my home, is one. Back in June, turnout for the primary was up 12 percent here, the highest in a mid-term primary since 1998. Still, the total turnout in the county was just 28.9 percent, among the lowest in the state. One local news outlet, the public radio station KPCC, decided to tackle the problem head-on, with a multi-platform approach that incorporates in-person events, radio segments and direct interaction with its audience via GroundSource, a messaging platform and service that enables direct, two-way connections between newsrooms and people, bypassing social media and other intermediaries. The GroundSource element of the work was subsidized by a grant from CLEF, the Community Listening and Engagement Fund (this piece is supported by that funding as well). Outlet: KPCC, a public radio station operated by Southern California Public Radio (SCPR), a subsidiary of American Public Media Group. The station’s radio programming reaches more than 600,000 listeners each week, and its livestreams, podcasts and other digital offerings draw 900,000 visitors a month. The station also hosts multiple community-focused events each month. This Tuesday’s offering, designed especially for voters, is Democracy and Donuts — An Election Day Drop-In. Challenge: To combat voter apathy and confusion in and around Los Angeles. 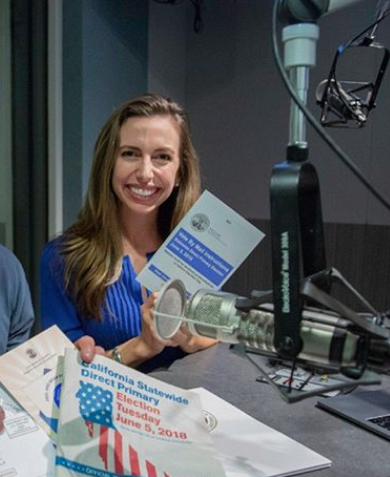 “Our region is known for some of the lowest voter turnouts in the state,” Kristen Muller, chief content officer for Southern California Public Radio, observed in a blog post last summer. Idea: To assign a full-time politics reporter to tackle the problem on multiple fronts, including the creation a “a kind of human voters guide,” so described by then-vice president of content Melanie Sill. The staffer assigned to the task was senior politics reporter Mary Plummer. Her first adjustment — a big one — came in response to the types of questions that emerged from conversations with community members at a listening booth at a local restaurant in Watts and a swap meet in Santa Clarita. People were not ready to dig into questions about the doings at City Hall, Plummer found, or about what their elected officials were up to or how they were helping the community. First they needed basic information about the electoral process itself. And so was born the Human Voter Guide, embodied by Plummer, to tackle burning questions of all shapes and sizes related to elections across the region. The station put out the word on its airwaves, on social media, email and via GroundSource, enabling the KPCC audience to submit questions via, phone calls or text. Execution: It’s one thing to launch such a project. It’s another to be able to deliver on the promise. “As soon as the questions started coming in I realized I was going to need to educate myself on the nuts and bolts” of how elections work, Plummer said. Questions ranged from where to vote, to whether a homeless person could register, to what happened if you signed up to vote by mail but decided you wanted to vote in person instead. 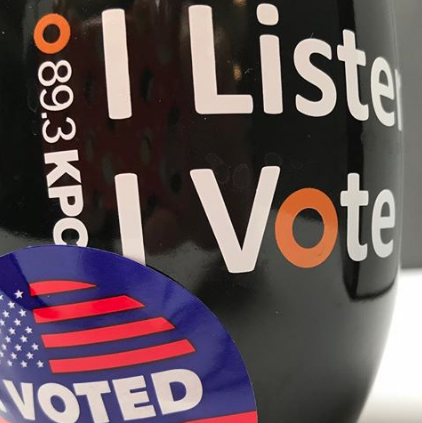 (All of these questions and more are now addressed on the Human Voter Guide page on KPCC’s website). Over time, Plummer’s commitment to the work helped her establish ongoing relationships with her sources, and she’s now able to tackle just about any question that comes to the Human Voter Guide with relative ease. 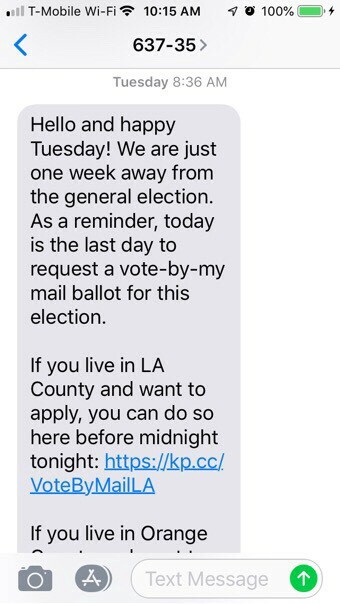 Along the way, the Human Voter Guide began incorporating texting via GroundSource into its outreach, both to elicit questions and to remind people of upcoming dates and deadlines. Those who signed up for text alerts received reminders on the last day to register to vote and the last day to request to vote by mail. “GroundSource is one of the fun things about this project,” Plummer said. “People really seem to like getting these texts. It’s easy and very accessible.” A “huge percentage” of the questions to the Human Voter Guide have come via text, Plummer said. As of mid-day Monday, the day before the midterm, the station had fielded 307 questions via the Human Voter Guide. Of those, 275 had received a direct response. The guide also shared 23 tips and nudges (like the one in the image above). “One benefit that we didn’t anticipate is that these questions are leading to real stories for us,” Oshiro said. In the June primary, a user of the Human Voter Guide alerted the station that names of registered voters were missing at their polling places on election day — crucial hours before the registrar acknowledged the problem, which affected more than 100,000 people. “Thanks to a voter letting us know, we were among the first to report the glitch,” Oshiro said. It’s hard to say what new wrinkles might emerge on Tuesday, but no matter, what Oshiro and Plummer say the Human Voter Guide will be ready.